Dr Joy St John, WHO Assistant Director-General for Climate and Other Determinants of Health, attended the meeting. She emphasized that WHO Director-General Dr Tedros Adhanom Ghebreyesus views climate change and health as a global priority, and pointed to its inclusion in the WHO 13th General Programme of Work 2019–2023, recently adopted at the World Health Assembly. The HIC is a working group of the European Environment and Health Process. It was established by the European Environment and Health Task Force in 2012 to promote the protection of health from the adverse effects of climate change. 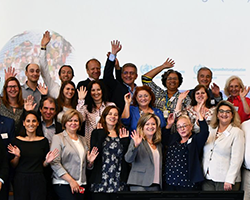 The HIC facilitates dialogue and cooperation among European Member States and other stakeholders, as well as communication and implementation of commitments to protect health from the adverse effects of climate change. At the Sixth Ministerial Conference on Environment and Health, held in Ostrava, Czechia, on 13–15 June 2017, Member States committed to develop national portfolios of action on environment and health in 7 priority areas, including climate change and health. The HIC acts as a catalyst in promoting, implementing and monitoring progress on these commitments set out in the 2017 Ostrava Declaration at international, national and subnational levels. Actions related to climate change and health need to be broad, coherent, coordinated and based on evidence. At the same time, portfolios should take into account the progress that has already been achieved or that could be achieved through the implementation of other commitments, including those that fall under the 2030 Agenda for Sustainable Development and the Paris Agreement on climate change. The meeting also served as a venue for informing Member States of the outcomes of the joint WHO–European Commission project on addressing the impacts of climate change and health, to launch the joint WHO–United Nations Framework Convention on Climate Change initiative on developing climate and health country profiles, and to drive forward the ongoing update of WHO guidance on heat–health action planning. Representatives at the meeting welcomed a new co-chair, Dr Luc Tsachoua from the Belgian Federal Public Service for Health, Food Chain Safety and Environment. Dr Tsachoua joined incumbent Dr Jutta Litvinovitch from the German Federal Ministry for the Environment, Nature Conservation and Nuclear Safety. The representatives thanked outgoing co-chair Professor Patrick Rampal from the Scientific Centre of Monaco for his years of dedication representing the group at international fora. For nearly 2 decades, the ECEH has been at the global forefront of evidence-based policy development to protect populations from the health effects of climate change. The ECEH supports Member States in assessing vulnerabilities to and impacts of climate change, enhancing disease surveillance for climate-sensitive vector-borne diseases, and improving preparedness planning and response to extreme events such as heat waves and flooding. The HIC’s establishment provided a regular platform to effectively share this technical expertise that has been steadily building in the Region.